709 S McKinley Ave, Arlington Heights IL 60005. 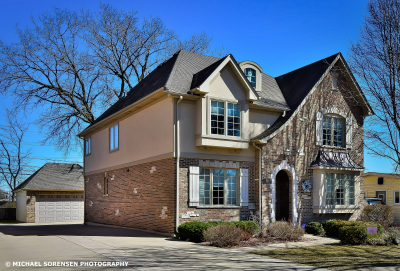 Schedule a Showing: (773) 987-8224. Special offers: $6,000 closing credit to buyer/ commission rebate available when you buy this home with Michael Sorensen as your buyer agent. WELCOME TO 709 S MCKINLEY AVE. PRISTINE! FABULOUS NEWER CONSTRUCTION HOME BUILT IN 2005. BEAUTIFUL ENGLISH TUDOR LOCATED IN SOUGHT AFTER SCHOOL DISTRICTS 25 AND 214! FEATURES 4 BEDROOMS AND 4.5 BATHS. SEPARATE DINING ROOM, LIVING ROOM, FAMILY ROOM WITH WOOD BURNING FIREPLACE AND EXTRA LARGE OPEN CONCEPT KITCHEN WITH GRANITE COUNTERS AND ISLAND. BEAUTIFUL OAK HARDWOOD FLOORS. CROWN MOLDING THROUHGOUT MAIN LEVEL AND 2ND FLOOR. MASTER BEDROOM HAS 2 HIS & HERS WALK-IN CLOSETS, SLIDER DOOR TO BALCONY AND EN-SUITE BATHROOM WITH JETTED TUB AND DOUBLE SHOWER. 38X20 FULL FINISHED BASEMENT WITH FULL BATHROOM AND A BAR ALONG WITH PLENTY OF STORAGE. COMPOSITE DECK NEVER NEEDS TO BE REPLACED. EXCELLENT LOCATION WITHIN WALKING DISTANCE TO ELEMENTARY SCHOOL AND BEAUTIFUL PARKS. APPROX 1 MILE FROM THE METRA TRAIN AND DOWNTOWN ARLINGTON HEIGHTS THAT OFFERS GREAT RESTAURANTS AND ENTERTAINMENT.